Before you start anything, it is important to consider how you want the overall presentation to look. While the content of your presentation is most important, the first thing anybody will notice is the general appearance of the slides. First impressions do mean a lot and nothing screams “the next thirty minutes are going to be torture” louder than Presentations Handbook. Pay attention to the color scheme of your presentation. Avoid using font with light colors against a light background. Use dark text on a light background. Use light text on a dark background. This color scheme is a poor choice. Avoid using “fun” fonts like Comic sans. Keep it simple, concise, professional, and easy to read. Avoid using gimmicky features like Word-arts and wacky animations. Do not present a wall of text. Nobody wants to see a slide filled to the brim with text. Your slides are meant to supplement your presentation, not be your presentation. Display the main points, important data, and appropriate figures. Think of each slide as a barebones outline of your talking points. You don’t need to use grammatically complete sentences to convey complete thoughts. When you start to do that on your slides, it can feel like you’re rambling on and it becomes distracting. People will start to gloss over things and not focus on key points. It becomes overwhelming. Now take a look at the earlier points of this section. If you started to skim once you got here, consider how your audience may feel seeing something similar. The eyes are very good at picking up differences, changes. It can be distracting. It can bias someone against you. If you didn’t bother correcting that mistake, how can I trust that you were meticulous in following your protocol? If you are ever in doubt, focus your design on readability. In the title page, you will include the title of your work or the title of what it is you will be presenting as well as the name of the author and any affiliated institutions and organizations. If you are presenting the results of a paper, or an abstract, you might be tempted to copy the title of the original work – which is fine most of the time. Do, however, keep in mind that being clear and concise is preferable to being verbose and obtuse. This will be a central theme moving forward. The title page will present the best opportunity to introduce yourself, as well as the nature of your work, to the audience. You will not spend a lot of time on this slide, but it’s good to start off on the right foot. You have already introduced yourself and your work’s title. Now is the time to communicate to the audience what the broad strokes of your presentation are. Think of it as telling a story and start from the beginning. It sounds simple enough, but when you have been immersed in a project for a long time and you know the ins and outs, it will be challenging to remind yourself that your audience does not know what you know. So, for a case report, for example, you will start by introducing the patient’s presentation. Focus on answering the questions: who, what, when, and where? Build the narrative. If appropriate, try to add details that will help the audience remember or relate to the patient. 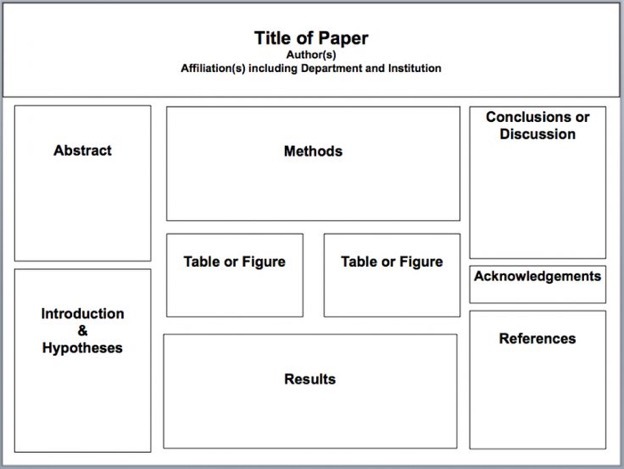 For a research abstract, or paper, you will briefly introduce the audience to the problem or the question that your research focused on. You will focus on why you were investigating that particular problem. As you conclude your introduction section, a natural transition should occur to a fairly brief background section. In this section you will discuss aspects of your topic that your audience otherwise don’t necessarily know. Don’t just repeat what you said in the introduction. Expand on each point. Provide details, facts. One of the main questions to answer in this section should be “Why is this research being conducted?” The answer to this question may be immediately apparent to you since you are the one presenting, but your audience may not otherwise understand the implications of your work. Continue to provide a brief history of the disease or process you are studying. How was it being treated previously? What is currently being done to treat it? At this point you should also provide statistics and epidemiological data to illustrate where treatments are today. Relevant statistics help to put your explanation into perspective and allows your audience to grasp the magnitude of your discussion right off the bat. At this point you will be better poised to answer the next question you pose: How does completing this research help? Describe some of the current efforts in this topic and how they are helping. Also describe some of the shortcomings of current efforts and what limitations are being faced by researchers. This will set you up well to next describe your methods and help you clarify your choices in your methods. A great way to determine if your audience understands the background of your research topic is to get audience involvement. This often involves asking questions at the beginning of the presentation to the audience and reflecting on the answers chosen before diving into the background information or your research within that topic. With those questions in mind, your audience has some idea of what to better understand in terms of learning objectives by the end of the presentation. In summary, the background section allows you to prime your audience for the relevance of your work. The background section is the “conversion factor” that converts the complexity of your topic to the level your audience needs to understand it. Use it to describe why you are doing this research, how it will help and what is currently being done. You should then be able to naturally transition to the Methods section described below. You will briefly elaborate on the methods that you used, if any. Don’t bore the audience with extremely technical language, but be sure that they know what you are talking about when you are ready to discuss your results. You might think that this is the substance of your paper. In reality, you want to keep this short. Focus on the salient aspects of your data that will support your conclusions. Don’t list off data points. Do become an expert in being able to display your data using helpful tables, graphs, and figures that demonstrate the most salient data in a clear, concise, precise, and meaningful way. It is important to remember the above points about readability and consider the best way to present your information. For example, a trend over time may better be represented by a plot/line graph versus a data table. In this section, you will only include descriptions of your data. Do not include any interpretations.This will be done in the next section, Discussion. Make sure to list the units for specific units of measurements for data. For example instead of listing the hemoglobin as simply 7.8, list it as 7.8 g/dL. Also, if a value is a percentage, be sure to make note of that in your presentation. Having presented your data, you will now discuss why your findings are meaningful. This is the part of the presentation in which you provide your interpretations of the data. What is the new understanding of the problem you researched? Also, this is where you will contextualize your data. For example, don’t be afraid to address what experiments you’d do next in this section. In your conclusion, you should restate your problem, or question, and provide an assessment of whether or not your goals were met. Look to the future as well. A narrative technique that can sometimes be successful here is closing the loop of a story that started in the introduction. Whether you’re reporting on a success or a failure, always close on a positive note, and give your thanks to the audience. In addition to an effective, structured Slideshow to show off your work, you will still need to actively and engagingly describe your work to your audience. Tailor your verbal presentation to the audience’s level. Explain items you have put up on your slides that may not be apparent to those not an expert in your field. Match your audience’s mood so your presentation lands best and makes the most impact. Make eye contact with people in the room. It will make people feel like they are being presented to and helps them connect with you on your material. Move occasionally between points and use your hands to be emphatic. Unless there is a clear speaker’s location, like a podium, it really helps the audience to “feel” the different points and aspects of your work if you move around the stage occasionally as you present. Using your hands also allows the audience to use their eyes in addition to their ears and is more likely to keep them focused. Ask questions every now and then to make the audience think. Depending on the allotted time, you may have the audience respond either with shout-out answers or even an audience response system. This allows people to think critically about your work and places them in the same problem solver’s seat that you were placed in when you did the work you are now presenting. Use anecdotes effectively without digressing. Many presenters give brief stories or tell small jokes on topics related to what they are speaking about. While this is mostly encouraged, be careful that you do not digress or use up too much time. Do not spend so much time on the anecdote/joke that the audience forgets about the main point you were trying to support. Vary your pitch but maintain a steady volume and pace when speaking. Do not present with a monotone voice because that is probably the easiest way to make your audience lose interest! A consistent and confident voice will keep the audience engaged. Do not read verbatim off the slides! The audience can read and do not want their time spent with you reading to them. Use your slides as an aid to your verbal presentation. Do not put too much text on your slides and do not let them be too distracting. Practice, practice, practice! Make sure to go through several runs of your presentation on your own time. It is highly recommended that you also practice in a room with a projector if one is available. Slides that appear easy to read on a computer screen can be hard to read on different projectors depending on the colors used and the capabilities of the projector. A powerful presentation using the above guidelines will leave a lasting image of you in the minds of your audience. Use the presentation as a tool to describe your ideas and passion for the topic. Although similar to an oral presentation, the goals of a poster presentation are slightly different. While your primary objective should be to present a concise, easily understandable summary of your work, the poster presentation is unique in that it should be understandable to meeting attendees without you standing at the poster to explain anything. Remember that while your poster session will span a specific period of time, the poster will likely be hanging in the meeting hall/exhibit area for a much longer period of time. To that end, a logical layout and language/figures that are easy to follow are helpful devices in ensuring the content of your poster reaches the maximum number of scientists - not just those who happen to stop by while you are standing by it. This approach will also help keep your oral presentation brief and focused without missing any important messages surrounding your work. As a first step, be sure to confirm the dimensions of the poster for the meeting. Typical poster sizes are around 4 feet wide by 3 feet tall, though this may vary. In laying out the poster, it is helpful to have a title/author block across the top and then divide the remaining space into quarters. Allocate the leftmost quarter to Introduction/Objectives/Methods, the middle two quarters to Data/Results, and the rightmost quarter to Discussion/Conclusions. Separate each subsection of the poster with a header, and consider using bullet points over prose for visual aesthetics and clarity of message.